Quora is one of the largest online communities for questions and answers, as well as one of the highest quality user generated content platforms. 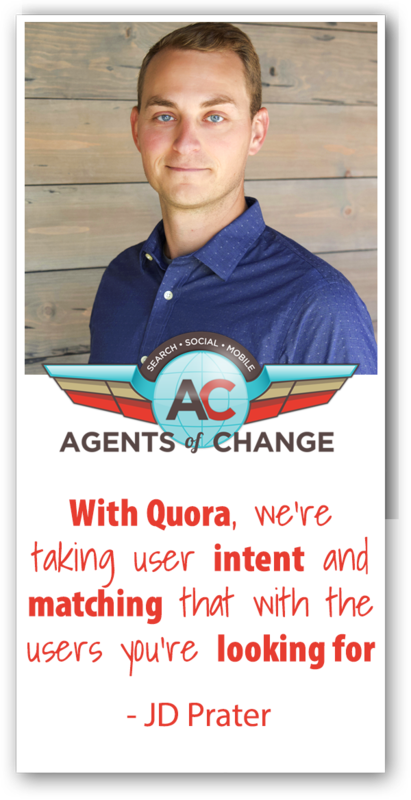 As a Quora evangelist, JD Prater knows firsthand how leveraging the power of Quora’s user intent makes it a smart new option for marketers. While it offers many of the same options for marketers that they have become familiar with and embrace on platforms such as LinkedIn and Facebook, Quora also offers unique opportunities for businesses and brands to build their expertise on given topics, as well as directly answer questions coming from actual users and potential customers. Rich: He is the Quora evangelist, he’s a performance marketer and digital media strategist with a passion for organizing data into actionable stories. His expertise is in crafting marketing strategies and campaigns that drive acquisition, retention, and engagement, across the customer lifecycle. He has been cited as the Top 25 Most Influential PPC Experts – voted #10 – and Top Demand Gen Hero to Watch, voted #3 by Drift. He’s also spoken at some of the top marketing conferences including SXSW, PubCon, Inbound, and more. I’m very excited to have on the show JD Prater. JD, welcome to the show. JD: Hey, thanks for having me. That was a really good introduction. Rich: Well I’ve been practicing it all day. I don’t have a lot else to do, so I just sit here and I just practice until I’ve got my DJ voice down. So let’s start with some basics. What is Quora? JD: So Quora is a knowledge sharing platform. And the way that we organize and share this knowledge is through questions and answers. So that’s the short, quick way of thinking about Quora. Anyone out there that’s familiar, not so much “forum” but really question and answer. I just want to make that slight little differentiation. Rich: Right. And so this is almost entirely – if not entirely – user generated content. People come to the website, they ask questions, and then other people respond to those questions. Correct? JD: Yeah, 100%. And I like to even think of it as demand driven questions and answers. So I really like that idea. But yeah, 100% everything is coming from human beings. Quora asks everyone to use their real names, we have a real name policy, and so that also helps filter out a lot of the bots that you may see, or even low quality information that you may see across it. Rich: Now there certainly have been other question and answer sites in the past, some that still exist, Yahoo! Answers, LinkedIn used to have a question and answer section as well. Quora kind of came on the scene and then really stuck around, and like every business there are ebbs and flows. But is there something that makes Quora different? And I know obviously you work for Quora so you’ve got your own opinion. But what is it that has drawn people to the platform? JD: Yeah, like you said there’s been other attempts, and what we’ve seen is it’s really difficult. That’s just what it comes down to. To get knowledge out of people’s heads and onto the internet where it can live in this evergreen format is really difficult. So I think for me – even before joining Quora – I think I would say that they’re really good at the personalization aspect. Internally we call it “knowledge routing”. So how do you get knowledge to the right person at the right time? And so that knowledge can be in the form of answers, “Hey Rich, check out this answer we think you’d be really interested in”, or “Hey Rich, here is a question that we think you’d be an expert in, and you can go and answer that for us.” And so that’ how we think about it. Rich: My experience on the site will dictate my future experience on the site. JD: 100%. And the more you use it, the better it gets. So a lot of people come in and they might use it once a month or they’re brand new to Quora and their experience isn’t going to be as good as someone that uses it every single day. Rich: So that brings up a good question, how are people using it, and more specifically, how are marketers using it? Because I do know that marketers see this as a platform for them to market their business or their audience. JD: Oh man, this is a good one. So I think most people come to Quora and they really are trying to learn about the world around them. That could include your product and your service. So I think a lot of people are coming to understand different experiences, they’re trying to understand and crowd source different answers, and so I do think there are a couple of different use cases within that. That said, this is a great time for marketers to take advantage of that. Because what marketers want to be in front of is when their audience has this intent. And this intent is so important because you can get down to the idea of evaluation and consideration, that research phase. So that’s whenever we kind of think about the AIDA Model, if you will. It’s getting into that decision making, and so people are coming on and asking, “Hey, which CRM is better, Salesforce or Hubspot?” If I’m Salesforce or Hubspot you better believe I want to have the answer and maybe even an ad there. But as a user, I’m going to get a ton of really good reviews about Salesforce or Hubspot. Rich: Now when you’re doing one of those kind of questions – whether it’s about CMS’s, or ice cream, or gluten-free dough – you’re going to post a question there and your hope is that you’re going to get back some honest feedback, and I totally understand where if somebody has a vested interest in this they’re going to talk about their own stuff, or they might have done a review on these things. If I’m answering a question, can I create a link to a review I’ve done elsewhere, or do you kind of keep everything within the Quora garden, so to speak? JD: That’s a fantastic question, and one I get a lot. The first way I’ll preface this is when you go to ask a question, you actually get to pick who answers it. And what I mean by that is, you can ask a question and then the very next part of that is, “request answers”. And what we’ll do is, based off of the topics of that question, we’re going to propose people that we think would be experts with in this. And we’ll give you a list and you can send them a request to answer this. So it’s a really great way for you to also control who is going to be answering. It doesn’t mean that they’re going to answer, but it is a good way for you to also send that out. That said, as far as answering the question, there’s a couple of different ways that you can think about it. So some people have come onto Quora as more of marketers, and they are wanting to build thought leadership and credibility on the platform. So what they’ll do is they’ll go on and answer the question and provide a ton of value and give the very best answer that they can with no sales pitch involved. Totally fine. Another way that you could do this is also, answer the question. So you can have this review, you can have your blog, and you can actually copy & paste, give it a citation and say, “Hey, this is where I got this information. If you want to go learn more, here’s a link”. So both of those work, both of them are slightly different. I like to use, and I would probably advise, use a combination of those two. So where you actually are building this audience and you are building thought leadership and credibility, but at the same time you also want to push people back to your website. And that’s a really good way to do that. Rich: Ok, so one question I have is, if I want to be seen as an expert on podcasting or digital marketing or replacement showers, whatever it may be, how do I get on the short list of experts for specific questions? The ones that you feed out to people asking questions. JD: So what you can do – and this is what I would tell anyone to do – is focus on a couple of topics. So if you want to be an expert on podcasting, start answering questions about podcasting. And so what we do is, Quora is divided up into topics, and that’s how we categorize every question and answer on the platform. So go do a quick search on the topic “podcasting”, we’re going to give you a bunch of questions, start answering those questions. And what you’ll end up doing is you’ll build up a repertoire, and you’ll build credibility, and thought leadership and an expert in podcasting. So that way if people have a question about podcasts, and then we surface those people, they’re going to see Rich has 25 answers on podcasting, I bet this guy knows what’s going on. The second piece to that is also leverage your title. So whenever you’re building out your Quora profile you can create your title, you can also create your credentials. And what you can say is, “I’ve been podcasting for 10 years, I have 3 podcasts”, whatever that may be, it also gives that credibility within that title. So take advantage of that space to do that. Rich: And it sounds like I should narrow my focus. So if I’m an “expert” in Facebook, and Twitter, and LinkedIn, and gluten-free breads – I don’t know why I keep going back to that one – and planetary solar system, and how to use Excel, and comic books, probably if I want to be thought of as a thought leader, I should really just focus on one or two topics, correct? JD: That’s what I would recommend. I also think it helps you not get overwhelmed. We all have information that’s unique to us that’s only in our heads, and it’s only in these conversations that we’re having with each other, and what we’re trying to figure out is what are you the very best expert at. Like, what is your knowledge in. A lot of us are in this digital media world where we are Facebook, Twitter, LinkedIn, Quora ads experts, so we have all this knowledge. I know that you interviewed AJ Wilcox, AJ does a great job of answering nearly every question on LinkedIn ads on Quora, as a great example. Rich: What if you’re an expert in something that might be considered to be controversial? Like what if you’re an expert on whether or not we should build the wall on our southern border, or whether or not pot should be legal, or something like that, or what ISIS stands for? Not literally, but the letters, you know what I mean. But what I’m saying is, there must be people with very different opinions, and I’ve even seen on Wikipedia where they’ve had to lock down certain topics. How do you guys manage when there is experts of differing opinions on a specific topic within Quora? JD: So I’ll kind of talk to our guidelines, and then I’ll get into a little bit of the background, like the machine learning part of it and the algorithm piece of it. But Quora has a “be nice, be respectful” – BN/BR – and it’s our policy of 1) you’re using your name so you can’t hide behind a made up user name, which is different than other answer or even forums. So that part helps weed out I would say a lot of the stuff that you would see get nasty in other platforms. And then the other piece to that is, people are very respectful I think in their answers. That said, there are people who also abuse that. So we have a whole moderation team, so whenever people get flagged. You can flag. If you’re being harassed, you can flag someone, and that actually gets human review. And I think that’s the part that’s really cool. Now there’s also a computer view, and this is the algorithms that are really trying to detect certain words and certain maybe topics that you said are inflammatory. And so it’s done a pretty good job. But that said, those debates happen on Quora all the time. Where we have experts in politics, like there are Senator’s aides or working for a certain Senator that are answering questions about this stuff, and so you actually get to hear from an expert on building the wall, pro or against, in the same answer. And you as a user can upvote, you can comment on these. Again, in the comment, it’s “be nice, be respectful”. Rich: Ok. You brought up our mutual friend, AJ Wilcox, he was actually the guy that alerted me that there was an advertising platform on Quora. So tell me a little bit about that. JD: Yeah. So we are now, it will be two years in May, since we’ve come out of Beta. So still the new kid on the block, but absolutely laser focused on ROI. We have built out a very robust ads platform in under two years, and it’s something that we’re extremely excited about. We’ve had over tens of thousands of advertisers already sign up for ad accounts, and we’re seeing a lot of great success and feedback from advertisers helping us build a platform that’s really helping advertisers reach that target audience with that intent, and also drive results and the traffic that they’re looking for. Rich: Ok. So talk to me a little bit about how do we target? Like are we targeting by topic, are we targeting by keyword? Do you know enough about your users where I can say I want to reach everybody in the state of Maine who’s a small business owner and supports underage drinking? Again, I’m scrambling here it’s Friday afternoon, that was a terrible topic to choose. But you know what I’m saying. What kind of targeting tools do we have there? JD: So you mentioned one of them, topic targeting, so that is available. One thing you’ll notice within Quora is really this hybrid of search and social, and that makes it really fun when it comes down to targeting. Because what we’re going to offer is behavioral targeting, we’re also going to offer contextual targeting. So behavioral targeting is what Facebook looks like, contextual is what Google looks like. So an example of some behavioral targeting that we offer is, we offer interest targeting. That is going to be very similar to topic targeting, it’s just where the ad is placed. I’ll get into that in just a second. And then for contextual we offer keyword targeting as an example. We also offer question targeting that means you can target very specific questions on there. So we’ve been pretty excited about what’s been launched so far, as far as performance advertisers. And then for the brand advertisers we also have broad targeting, which allows you to target everyone across the platform. So if you’ve got a product out there that is appealing to the masses, you can also take advantage of broad targeting. Rich: Sure. So Coke could do something like that where I might be more in just finding small business owners and marketers who are an hour from my office, or something like that. JD: Yeah, that’s a great point, I forgot to mention we also offer location targeting. So location targeting is down to country, state, and city. And then we also offer platform – or I should say “device”. So you can also target desktop, mobile, or desktop and mobile at the same time. So if you’re knowing that you want to reach desktop users and hour from Denver and the surrounding metro, you can take advantage of that as well. Rich: So you mentioned lookalike audiences, and on Facebook they are incredibly powerful. I can take my email list, I can upload them, and then Mark Zuckerberg somehow finds people who are like the people who are on my email list. Is that what you’re offering, or some version thereof? JD: Yeah, definitely. So the Facebook lookalike audiences are just crushing it for every advertiser out there. Facebook has done such a great job with their algorithm, it’s also got them a little bit in trouble with how much data they have on you, recently. As an advertiser it’s been kind of fun to watch that. But same thing with Quora, we’re taking that user intent and we’re able to match that with the users that you’re looking for. So you can upload your email list, you can also create them based off of website lists. So you can install the core pixel, build those remarketing lists, which is always a great way to get started. If you don’t think your audience is on there, just put on the pixel and see what you can remarket to. Rich: That’s really interesting. So we talked a little bit about the lookalike audiences, tell me, what do the ads look like? Do they just show up in the answers section, or do you have different ad products out there? JD: Yeah, this is one that we’re slowly working on and building within the ad placements, But right now I’ll kind of give you what an ad looks like, and then I’ll kind of break out where they could appear. So we have three different ad units right now. We have image ads, we have text ads, and the only real difference between those two is one includes an image, but they’re going to look almost identical but the one has a small image accompanied with it. And we also have promoted answers. Promoted answers are brand new – they just came out a few months ago – and that’s what’s going to feel like the Facebook boost button or promoting a tweet or a LinkedIn sponsored update. So advertisers are very familiar with those three, you can now do the same thing on Quora where you’re taking an answer that you’ve written and now you’re promoting it to the audience that you want to get in front of. So that’s another great way to get that value. Then the best part about it is, just launched in January, you can retarget everyone who has seen questions. So if you’re promoting your answer, you can actually retarget everyone who has seen it and slowly move them down the funnel as a way to prime and remind them. Which I am a huge fan. Rich: So even if my ad came out afterwards, I could actually almost roll back the clock to get my answer in front of people who have asked that question in the past? JD: Anyone that has seen that question or answer in the last 30 days. Rich: Nice. And I’m assuming that with these ads we can send people offsite to our websites or landing pages? JD: Yeah, 100%. So promoted answers is the only one that keeps people onsite. Of course I would recommend having a link in your promoted answer, as kin of your CTA, if you will. But everything else is going offsite to your website or to an app install. We also offer app install campaigns for those app advertisers. Rich: I see how that would be really important to people answering questions either about the app itself or about the category of that app. Marketers always want to know how they’re doing. What kind of metrics are you guys able to show us? JD: So as far as metrics go we have an Ads Manager, so we’ll be able to show you all of your click information, so your impressions, your clicks, your CTR, your CPCs, your CPMs. And then if you’re using the pixel and doing a conversion campaign, we’ll give you the conversions that we’re seeing that up your conversion tracking – just like you would with Facebook or Google – and we’ll be able to track that there as well. But it should feel very similar to what the other networks are doing. What we’re working on in the future for 2019 is giving you even more granularity within the Ads Manager of those breakdowns, whatever you can kind of slice & dice that data in a way that makes sense for you. So that’s what you have to look forward to in 2019. Rich: Ok. And JD, I’m sure there are going to be some businesses that are better suited or not as well suited for het Quora ad platform, what do you think some of the really good ones are? Like, what kind of businesses have you seen having success with the ad platform? JD: So we have over 300 million monthly visitors coming to Quora, so we’re growing, we’re growing fast. But we’re not 2.5 billion of Facebook, we’re not Google’s 90% market share. So the scale is definitely something that we’re not going to have right now, but you can still drive results. What we’re seeing with our customers that are having success right now is, really the advertisers that have a product that’s national, that helps. So if you need to reach everyone in Stillwater, OK – which is where I was born – you may not do well. So local advertisers, we just may not have enough reach for you. So in my opinion I would look at it like the national advertisers are doing extremely well. We’re doing really well in the B2B space, B2B advertisers know that it’s a longer sales cycle, so getting in front of their audience when they’re looking at views and they’re comparing products and evaluating products, it’s a really good space to be in. So I would say those have been by far the best performing. And it’s about right now 60% of our advertisers are B2B, and about 40% are B2C. Rich: What mistakes are you seeing people make, or what mistakes do you think that they’re making when they are advertising on Quora. JD: I think there’s two mistakes that I would say that I see the most often. One is not understanding Quora. We have a lot of advertisers coming in and when they don’t understand Quora, they don’t understand how Quora works necessarily and how Quora is organized. And so they’re having a hard time structuring their campaigns and their ad sets an even writing ads that make sense. They’re wanting to bring in their best performing Facebook ad and it’s just not the same platform. So you really have to understand your Quora strategy. And I think the second part of that is also not doing the audience research. And what I mean by that is they want to come in and they want to target these questions that they know are the best questions, then wonder why they’re only getting like 2,000 impressions a month. And we’re like, yeah, because you’re targeting like 2 questions. You’re going to have to break out a little bit more if you’re wanting that scale. That said, if those 2,000 impressions are the lowest in the funnel that you can get in front of, go ahead and run it. I have no issue there, that’s where I want to be. But at the same time, just know you’re not going to get that many results when it comes down to it. So I think those are the main two things. It’s really the audience research piece of it, and then understanding what’s going to work and scale on the platform. Rich: Before I let you go, is there anything else that we didn’t touch about Quora that you’d like to share with the audience? JD: Yeah, I think the only other thing I’d just quickly walk people through is we also offer CPC bidding. So you’ll be very familiar with that one for all you Google people. We also offer CPM bidding, so all the brand advertisers, the Coca-Colas, the Amazons of the world are all about the eyeballs. We also offer CPA bidding. So again, if you have your conversion pixel in place we do ask about right around 20 conversions per week is what we like to see. So if we can get more than 20, of course that only helps in feeding that algorithm and getting us the best results. But just knowing that you have those three bidding options I think is also really important to call out. Rich: This has been great, JD, I definitely learned a lot more about the platform, both from a marketing standpoint, and an advertising standpoint. And of course I know you want to send people to Quora – and we will – but where else might people connect with you online? JD: Connect with me on Twitter, I’m super active on Twitter, it’s @JDPrater, no surprise there. And then for LinkedIn, you can connect with me there as well. I try to make sure to answer advertiser’s questions, but I also give sneak peeks at what we’re working on, so that way I can kind of keep it fun and interesting on those two platforms. So I try to give you that value. Rich: Awesome, this has been great and very informative. I want to thank you for your time and I appreciate it, JD. JD: Yeah, thank you for having me on. JD Prater believes that Quora is a great way for marketers to spread knowledge, versus coming off as just “hustling” for business, and the long term results are proving this platform has the chops to make a difference for brands and businesses. Be sure to check JD out on LinkedIn as well as Twitter, where he loves to give sneak peeks at what they’re working on over at Quora.